It’s hard to deny the fact that our day to day lives are saturated with the products from metal stamping machines. From the car you drive to the stove you use at home, metal stamping plays a role. You may believe the metal fabrication industry is only necessary for a very narrow sector of the business world, but in fact, many companies could largely benefit from these types of services. The need for these metal processes is almost inescapable once you realize how common the application of it is, and understanding this can ensure that you choose the right metal stamping company for the job. Don’t believe me? Keep reading and we’ll show you just how common this service really is, and why it’s so beneficial. Before we get to the applications for stamping, we have to understand what it is. To put it simply, it is when a machine uses a mold to create metal shapes. Steel, brass, and aluminum are some of the most common metals used. The process of stamping can look different depending on what is being made, but shapes are usually made of sheet metal, put on a stamping die and placed in a stamping press. 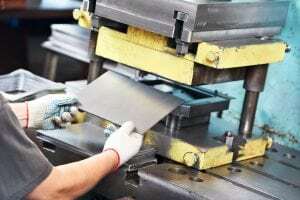 Industries ranging from Farming to Aerospace use the services of a metal stamping company, and yes, even the device you’re reading this on is probably a product of a metal stamping machine. Metal stamping is a precise science that requires extensive training and a practical knowledge of physics. There is little room for mistake in this type of service so it’s important to find a company that takes their work seriously. Otherwise, you might be looking at a defective product. If you need a metal part, component or product created, there are many advantages of partnering with a company that offers the services of metal stamping machines. If your product needs to be cut with high accuracy, a stamping company will have the tools and processes in place to do so. Cutting a shape with such precision can be a large expense and it can be tempting to lower costs by lacking in this area of production. A stamping company allows for a higher quality product at a lesser price. Some businesses would tell you that consistent precision is only guaranteed by cutting pieces one-by-one, but most top metal companies agree that this isn’t true. Consistency in mass production can be achieved by carefully controlling the entire process, starting with precise, computer-aided design (CAD), proper tooling, professionally operated metal stamping machines, as well as quality control to inspect each piece or part and to ensure uniformity in products. This one speaks for itself. Need a large quantity of quality products? Hire a company that has the machinery and tools to manage your project in a quick and efficient manner. If you outsource your stamping to a company outside of your own, then there is no need to allocate time and space in your own place of business to make those products. Plus, it allows you to focus on the other aspects of your business and not get bogged down with the intricacies of production. The question is, who actually uses these services? According to Grand View Research, the automotive industry is the lead market for metal stamping industries, accounting for the 34.7% of its revenue in 2016. However, in this technology generation, the use of metal fabrication in the consumer electronics industry is rapidly growing. That means that almost any company who uses consumer electronics in their workspace is relying on a product made by metal stamping machines. Other smaller industries that make products like jewelry and household appliances can manufacture their products on a larger scale with the help of a metal stamping machine. You don’t need to be the head company of a leading industry to apply the work of a stamping company. Products of metal stamping aren’t simply just OEM car parts or hinges for millions of laptops. A small business that makes specialty or short-run products can use it, too. Perhaps, you want a prototype built for new farming equipment that you’ve invented, or you need to turn your hand-blown glass creations into lamps and require metal housing for the electrical components – you name it and the right company, like Frontier Metal, can deliver the results you’re looking to achieve. No business is too small to create quality and effective products. Stamping companies typically won’t discriminate when it comes to metal. Metal stamping machines can take on many different types depending on the product and need. Used for its strength, steel can be pressed into products that need durability and elemental resistance. Automobiles, medical machinery, and aeronautic equipment all use metal stamped steel. Lightweight, resistant and flexible, its used in a variety of industries and is very widespread. Can be used for electrical equipment because of the electrical properties of zinc and copper that make it up. Like brass, it has properties that allow it to be very useful for electrical instruments. What can you take from all of this? The application of metal stamping is highly common. Almost every business has been affected by the product of metal stamping machines. Metal stamping has helped created computers, musical instruments, and the engine of your car. The services of the metal stamping industry are not only beneficial to top industry leaders but also small businesses that are looking for quality and consistency. It’s a practice that is continually improving, becoming more precise, and effective for clients. As widespread as it is, and as important it is to the functionality of everyday life, it is of the utmost importance that companies learn about the process of metal stamping and allow themselves to seriously consider the stamping companies they employ. Feel free to contact us at Frontier Metal Stamping to find out if our metal stamping services could be helpful to build the quality and reputation of your company.